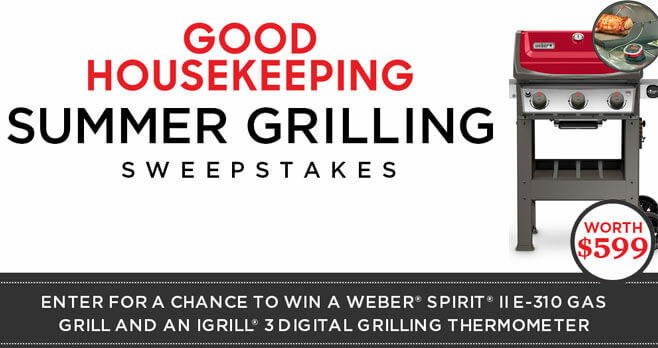 Good Housekeeping invites you to enter the Summer Grilling Sweepstakes by registering online at summergrilling.goodhousekeeping.com now through August 31 for a chance to win a Weber Spirit II E-310 Gas Grill and an iGrill 3 Digital Grilling Thermometer. Ends: Ends on August 31, 2018 at 11:59 PM (ET). Prize: The winner will receive a Weber Spirit II E-310 Gas Grill and an iGrill 3 Digital Grilling Thermometer. Eligibility: The Good Housekeeping Summer Grilling Sweepstakes is open to legal residents of the 50 United States and the District of Columbia, who have reached the age of majority in their state or territory of residence at time of entry. Void in Puerto Rico and Canada and where prohibited by law. As a subscriber I should have known Good Housekeeping would offer the perfect prize at the right time.